Growing up in our culture, we are told youth is beauty. Aging is undesirable- even though it’s preferred to death in most cases. As young girls, we push ourselves to mature- to surpass the golden milestones: thirteen, sixteen, eighteen, and the all-important twenty-one! We pass from child, to maiden. Then as twenty-something-year-olds, we cringe as thirty approaches. Where did those crinkles around our eyes come from? Is that our mother in the mirror? The biological clock ticks, tocks. Some of us have children, some not. But all of us pass from maiden to mother. If we aren’t mothers to children, we are mothers to family, pets, friends, even personal undertakings, desires. We fight off aging, reluctantly getting dragged into our forties and earning the title Middle-Aged. Before you know it, kids are grown, and our fifties peek out from the other side of the mountain. The dreaded “old” is coming for us and we fight it tooth and nail. We exercise like crazy to regain our flat bellies and round butts. We dye, tint, Botox and lift. We look longingly at ourselves in the mirror wondering what happened to our youth and soon find ourselves grasping onto middle-age while that, too, goes floating by. Aging is inevitable unless the unwanted happens- an untimely death. So why do we abhor it? Is it because all our lives we have been told that older women aren’t beautiful? For centuries, older women have been described as hags, biddies, old crones. No wonder we panic at the thought of aging! Everywhere we look, youth is embraced, cherished, worshiped. In the magazines, the movies, on the billboards. They all tell us “Young is Beautiful.” But what if I told you that aging doesn’t have to be that bad? What if you discovered that some of the trade-offs- firm breast to saggy; smooth skin to wrinkled; sharp eyesight to blurry- were worth it as we achieve grace, self-acceptance and wisdom? I would like to offer up a different vision of “crone”. A vision that has been embraced by many. One of a wise woman, whose soul shines from eyes crinkled with laughter, wrinkles that hug the compassionate face, a body still strong and able, even with pockets of pillows placed here and there. 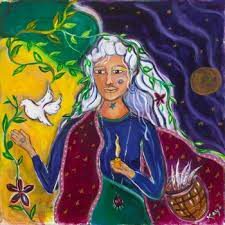 An elder woman whose dignity and understanding surround her in a light of peace, love, and wisdom. With her, always, the guardian spirit of the owl. Owl reveals wisdom, seeing beyond the dark. At fifty-five, I step onto the path of the crone, and I invite you to journey with me on this magical, loving path- the Path of the Crone and the Owl. As we close the chapter on 2018 and begin a new one for 2019, it’s important to release that which no longer serves us. Habits, belongings, unresolved issues tumbling around in our heart and mind- any of these which we do not wish to bring into the present and new year, should be abandoned. As I put away Christmas, it feels good to dust off shelves, knick knacks, blinds. I go through belongings, making a pile to donate and reorganizing what is left. I sit in quiet, forgive those who I have perceived as hurting me. Let go of that which I have no control over. I set my spirit right. On New Year’s Eve day, I crack open windows, and light up a smudge stick – going from room to room, clockwise, fanning the smoke, allowing it to reach all corners, clearing out stagnant, negative energies and sweeping them out the window. I will burn some incense to reignite the clean positive energy of our abode. I will Reiki the rooms. Then, I take stock. What did I accomplish in 2018? What did I decide I no longer wanted to pursue? What will my path be in the new year? What have I learned in 2018 and what do I hope to learn in 2019? Finally, I will end the day celebrating with my husband that we have come to the end of this year’s journey. With the deepest nights of winter before us, we dream of what will be, and feel grateful for what is. We will think on the sad times of the past year. Of people we lost. Of plans that fell through. We will smile on the happy times we shared in 2018, the people we met, the dreams that transpired into realities. And when the sun dawns on the first day of the new year, we will rise to meet it, and rejoice. I really have enjoyed going over the main seven chakras in the body. It’s been an excellent refresher and reminder on keeping the body in balance. We now come to the last of the main chakras of the body- Sahasrara. Located at the top of the head/ upper brain, Sahasrara is where the celestial energies flow into our conscious being, and where our higher conscious energies reach out to the heavens. As the root chakra provides a foundation for our body, the crown chakra provides a home for our beliefs, thoughts, and learnings. When open and balanced, we are able to process new ideas, shift old beliefs and connect to our higher-self/ Christ Conscious. Our crown chakra can be thrown off balance by overthinking, by overwhelming feelings of loneliness, or by not feeling connected to our higher being. This can bring about insomnia, inability to concentrate, feelings of paranoia, and can sometimes lead to conditions such as epilepsy or eye disorders. To balance the crown chakra, it helps to find a spiritual belief that nourishes your soul and feeds your mind. Being out in nature is also helpful as it both grounds the root chakra, opens the heart chakra and brings a higher feeling of connection to the world around us. Watching inspirational movies or reading inspirational books help, as well as practicing gratitude. Prayer and meditation help us to realize the will of God, as we perceive God, and opens the crown chakra even fuller. The element for Sahasrara is the universe, and it reigns over the pineal gland. Its color is a brilliant, deep purple. To bring balance to the crown chakra you can use essential oils and incense with lavender, rosewood, violet, and frankincense. Carry or wear gemstones amethyst, clear quartz, diamond, or white tourmaline. Music that lifts the crown chakra is Indian Ragas. The eagle is associated with the crown chakra, as it is believed to carry messages to and from God. In place of food, fasting is done. The positive Archetype is the Sage. The negative Archetype is the Egoist. For best results, perform outside. If indoors, use a blanket beneath you. Begin by laying on your back. It’s fine to place a small rolled up towel behind neck for support if needed. Also, if you have lower back issues, place a pillow under your knees. Lengthen your legs and spread them at a comfortable distance apart. Allow your body to completely relax. Now draw your shoulder blades underneath you and slightly bring your chin towards your chest. This will lengthen your neck. Breathe in deep, exhale. Relax. Your arms should be at your sides with palms facing up or down as you wish. The important feature of this pose is to be relaxed while your spine is lengthened. There should be no discomfort. Continue slow, deep breaths while visualizing a deep purple bubble surrounding you. Imagine the color swirling around you, expanding outwards. Remain in this position as long as you wish. Many of us have heard of the Third Eye, Ajna- the center of intuition. This chakra is known throughout many cultures and is an important area in many meditation practices to help connect us to God/Goddess/Universe. Located on the brow line between the eyes, it is also at the base of the skull and governs physical eyesight as well as intuition. Its vibration resonates with the color indigo. When Ajna is open and balanced, we are able to obtain gainful insight within the patterns showing up in our life, and we develop a keen sense of intuition. If our third eye chakra goes off balance or closes, we can experience severe headaches, nightmares, paranoia, eye problems, and even suffer a stroke. To balance the third eye chakra, we can journal our thoughts and daily activities, as well as our dreams. We can focus on tuning into our intuition and up our meditation practice. Wearing, carrying, or placing stones about such as lapis lazuli, purple flourite or azurite will help increase the third eye chakra vibrations in your space. So will burning incense or using essential oils of sweet pea, hyacinth and camphor. Play some classical music such as Beethoven or Bach. Meditate on the hawk and owl. There is no particular food associated with the third eye chakra, though purple foods in general can assist. These foods include purple grapes, plums, raisens, figs and passion fruit. Blackberries and blueberries also are included as purple foods. In place of food for strengthening the third eye chakra, you can add more meditation. A simple yoga pose to do for Ajna is the Child’s Pose, with our forehead pressed to the floor. To go into Child’s Pose, kneel on the floor with knees either together or opened, and bend forward. Stretch your arms forward, hands stretched out, and press your forehead to the floor. Take slow deep breaths, with your eyes closed and bring awareness to the Third eye. Draw your energy into the eye chakra and allow your thoughts to flow as they come. We now come to the fifth main chakra, the throat chakra. It’s the chakra I personally have had much energy work done on, so I could speak in front of an audience, and one that I have worked on over the years to learn how to speak my truth, and more importantly, truly listen to the truth of others. Visuddha resonates to the frequency of the color blue and is located in the mouth, jaw, throat, ears and shoulders. It’s through the throat chakra that we express our beliefs and take in beliefs of others. Speaking in a positive manner raises our vibration and can enhance our immunity. If we are not honest or we are not able to voice our thoughts and feelings, imbalance occurs. This imbalance may show up as a sore throat, incessant talking, rarely talking, neck stiffness, tight shoulders, TMJ and thyroid conditions. To bring Visuddha into balance we can sing, be creative, listen deeply to others, and speak truthfully while being mindful of speaking in a positive manner. Walk your talk and avoid gossip to keep the throat chakra open and balanced. The throat chakra rules the thyroid and parathyroid, and issues with these glands can indicate a need to balance the throat chakra. Incense and essential oils that help our fifth chakra include gardenia and blue chamomile. Wear or carry stones which resonate with the fifth chakra such as blue agate, sodalite, celestite, turquoise. Doing public speaking, or need to have an important talk with someone? Wear blue, especially if you have a blue scarf or necklace. Animals that connect with the vibration of Visuddha include the sparrowhawk, the elephant and the bull. Foods to be eaten when balancing the throat chakra are fruits and blueberries. A good yoga pose to do for the throat chakra is the Camel Pose. At the same time, this pose works on opening the heart chakra. These instructions come from The Yoga Outlet site. Begin by kneeling upright with your knees hip-distance apart. Rotate your thighs inward and press your shins and the tops of your feet into the floor. Do not squeeze your buttocks. Rest your hands on the back of your pelvis, with your fingers pointing to the floor. Lengthen your tailbone down toward the floor and widen the back of your pelvis. Lean back, with your chin slightly tucked toward your chest. Beginners can stay here, keeping their hands on their back pelvis. If you are comfortable here, you can take the pose even deeper. Reach back and hold onto each heel. Your palms should rest on your heels with your fingers pointing toward your toes and your thumbs holding the outside of each foot. Keep your thighs perpendicular to the floor, with your hips directly over your knees. If it is difficult to grasp your heels without feeling compression in your low back, tuck your toes to elevate your heels. You can also rest your hands on yoga blocks placed to the outside of each foot. Lift up through your pelvis, keeping your lower spine long. Turn your arms outward without squeezing your shoulder blades. Keep your head in a neutral position or allow it to drop back without straining or crunching your neck. Hold for 30-60 seconds. To release, bring your hands back to your front hips. Inhale, lead with your heart, and lift your torso by pushing your hips down toward the floor. Your head should come up last. Rest in Child’s Pose (Balasana) or Corpse Pose (Savasana). If you are a beginner, or not real flexible, use props as shown in the second picture. Never do any pose that hurts, and never force a stretch. If you aren’t sure yoga is right for you, check with your doctor. When open and balanced, the heart chakra allows love, including self-love, compassion, empathy and kindness. It links the lower three chakras with the upper three chakras, thus it is sometimes referred to as the physical and spiritual center of the body. It brings together body and mind, heaven and earth. Located in the center of the chest, Anahata governs the lungs, heart, thymus, arms and hands. The element of the heart chakra is air. Being outside in nature and breathing in fresh air is nourishing for this chakra. When the heart chakra is out of balance we might experience a feeling of overwhelming loneliness, high blood pressure and angina. We will find ourselves clenching our fists, and wanting to be isolated. To bring the heart chakra into balance, eat plenty of fresh vegetables. Burn incense or oils of rose, lily of the valley, carnation, or melissa. Carry or wear rose quartz, emerald, peridot, jade or moonstone. Light candles, do some deep breathing, and surround yourself with supportive friends. Animals that are associated with the heart chakra are dove and deer. Both invoke kindness, peace, and gentleness. A good yoga pose for the heart chakra is the Cat pose. Begin on your hands and knees, making sure your knees are aligned directly below your hips, and your wrist, elbows and shoulders are in line, perpendicular to the floor. Your head is in neutral position with a soft gaze to the floor. Inhale, and then as you exhale, round your spine toward the ceiling while keeping shoulders and knees in position. Allow your head to drop to the floor but don’t force your chin to your chest. Let it be a natural release. Inhale as you come back to starting position. *Please note, if you are not an active yoga practitioner, check with your physician before starting yoga if you have any health issues, neck or back issues, or joint problems. The third chakra, which is the Manipura Chakra, is also known as the Solar Plexus. Its location is just above the naval in the solar plexus and it governs the liver, pancreas, intestines, gallbladder and stomach. The color of the third chakra is yellow. The element associated with the solar chakra is fire. It is through the third chakra that we hold on to emotions dealing with family, friends and coworkers. Think of our ancestors, gathered with the tribe around the community fire. This is where discussion takes place, we share nourishing food, stay warm through the dark night. Imbalances in the third chakra include acid reflux, constipation, imbalance in metabolism, blood sugar imbalance, gallstones, anger, low self-esteem, low energy, lupus and other autoimmune disorders. To bring balance into the solar chakra, we should come through our truth in all we do, practice forgiveness and compassion, eat a healthy diet, and bring deep laughter into our days. Exercises that are good to keep third chakra balance are Ti Chi and Qi Gong. There are many resources for both. If you don’t wish to take instruction at a class, you can find excellent dvd’s and YouTube videos to help. The incense and oils resonating to this chakra are juniper, lemon, cinnamon, bergamot, and grapefruit. Try burning some incense, or mixing a few drops into lotion and applying. The sacral chakra resonates with the color yellow. Since it is also associated with fire, and with digestion, yellow makes a great color for kitchens, even in small doses such as curtains and towels. If you want to bring peace into a family, friend or coworker discussion, try wearing yellow or placing yellow flowers in the room. The stones for the third chakra include yellow citrine, topaz, amber. Wearing these stones, or carrying a small one in your pocket can help to keep balance. Music that relates to the third chakra is marches. Think big band songs, with an upbeat sound that lifts the energy, stokes the flames, and gets things moving. Animals associated with this chakra are lion and ram. Both show strength, endurance and dignity. Foods that feed this chakra are complex carbs such as whole grains, blueberries, kiwi, lentils, soybeans, black beans, broccoli, onions, and sweet potatoes. You can find a complete list online. This chakra’s positive archetype is the Spiritual Warrior. Its negative archetype is the Slave. The Sphinx pose will cool down an overactive Manipura Chakra, at the same time it tones the spine and stimulates the sacral-lumbar arch. To do this pose, lay down on your stomach, feet hip-width apart, and bring the elbows under the shoulders. If the pressure on your lower back feels too strong, bring your elbows a bit forward. If you want a deeper bend, you can place a block under the elbows. Hold the pose for 2-3 minutes and come out by first lowering your upper body onto the floor. Relax on the floor for at least 3-4 breaths, and once you feel ready, come to a child pose for 2-3 breaths. * Please check with your healthcare provider if you are new to yoga. Remember to never force any position. I recommend seeking a trained yoga instructor for beginners. The sanskrit word for the sacral chakra is swadhistana. This chakra is located about three inches below the naval and governs the kidneys, bladder, reproductive organs, sacrum and hips. Its color is orange. Imbalances in the sacral chakra can include chronic menstrual cramps, endometriosis, infertility, sterility, prostate problems, hip pain and sciatica pain. The glands that are governed by the sacral chakra are ovaries and testis. Any health issues with these glands should be considered an imbalance of the sacral chakra. The element for the sacral chakra is water, which ties it in close with the emotions. If you have experienced deep emotions, particularly stressful emotions, it’s a fair bet your sacral chakra is in need of some love. To balance the sacral chakra, try soaking in a warm bath with a few drops of rose or jasmine oil. Add some epsom salt to help with hip and sciatica pain. Swimming is another great way to balance the sacral chakra, as is dancing and yoga. If you choose dance, try some Latin music. Working with your sacral chakra is essential for pursuing your dreams. It’s the chakra of creation. Feeling stuck in a rut with your creativity? Wear orange. Have a favorite spot to do your creative work such as writing, drawing, painting, sewing? Paint one of the walls orange, or place some orange items about the space, where you will see them as you work. Another way to keep the sacral chakra in balance is to place boundaries up and let others know you expect them to respect your boundaries. Don’t forget- respect the boundaries of others as well. Do meditation complimented with an oil diffuser or burning incense. The oils that work well with the sacral chakra include rose, jasmine and orange. Carry or wear tiger’s eye, gold topaz or coral to maintain sacral chakra balance during difficult times. Animals associated with this chakra are sea creatures. Playing music made from whale songs is one way to connect to these creatures. So is visiting the ocean. Foods to help strengthen the sacral chakra are liquids. Pure water or jasmine tea are good examples. The positive archetype for this chakra is the Emperor/ Empress. The negative archetype for this chakra is Martyr. A good yoga pose to practice for the sacral chakra is the Cow Face Pose. Sit on the mat with your legs in front of you and bend your knees so your feet are flat on the floor. Slide your left foot under the right knee to the outside of the right hip. Cross your right leg over the left, your right foot will be to the outside of the left hip. Bring your heels in close to the hips. You might have to use your hands to tug them into place. Be mindful of your limitations. Sit evenly on your sitting bones. Stretch your right arm straight out to the right, bring it straight up and bend at the elbow so your right hand is behind your shoulder, elbow straight in the air. Bring your left arm behind your waist and hook your right fingers with the left fingers. If you can’t touch fingers, use a towel to help make the connection. Hold pose for one minute, then release, and switch sides. You may have heard of Chakras, but are unsure of what they are and what their purpose is. I am going to do a series of blogs focusing on each of the seven main chakras because when it comes to being in balance, it’s important to have well balanced and open chakras. The word “chakra” is Sanskrit and translates to “disc or wheel”. The term refers to spinning wheels of energy located throughout the body. These wheels help to move the body’s prana, or vital life source. Chakras govern every part of the body: bones, tissues, and organs as well as emotional, mental, and spiritual well-being. There are 114 chakras in the body. I will be covering the seven main chakras: root, sacral, solar plexus, heart, throat, third eye and crown. The first chakra is the Root Chakra. Located at the base of the spine. It covers the bones, feet, knees, legs, perineum, colon and coccyx. It is symbolized by the four-petal lotus flower. The color associated with the root chakra is red. This is the location of the fight or flight decisions. It stirs up passion, anger, and drive. Think about it- when someone is angry, it’s said they are “seeing red”. Red is tied to love- red hearts. When you “fall in love” it’s basically the energy falling through the chakras into the root chakra. When you ‘rise above’ something, you are rising out of your emotional root chakra to a higher state of mind. The root chakra helps to keep us feeling grounded, balanced, and secure. When the root chakra is off balance, we might experience insomnia, anxiety, phobias, and substance abuse. We might have issues with constipation. We might have aches and pain in our feet and our legs. To balance the root chakra, it’s important to maintain a nutritious diet and adequate sleep. Dancing and drumming help to bring the root chakra back into balance. The element associated with the root chakra is earth. Walking outdoors, especially if you can do so barefoot, helps to ground us and bring our root chakra into balance. You can also bring earth inside the home with vases of flowers, houseplants, and pictures of nature. Oils associated with the root chakra are cinnamon, sandalwood, rosewood, black pepper, cloves and cedarwood. Burning incense with these oils will permeate the air with their root chakra healing properties. You may try burning some during a meditation to balance the root chakra. Foods that help strengthen the root chakra are those high in protein such as nuts, dairy and meats. Be careful to eat organic when possible, and if any meats are digested, make sure they aren’t factory farmed animals. Stones that help balance the vibrational frequency of the Root Chakra include hematite, ruby, garnet, onyx and tiger’s eye. The animals associated with the root chakra are elephant and bull. If you want to bring your root chakra into balance, you can place small statues or pictures of these animals about your home or place of work. The gland associated with the root chakra is the adrenal gland, and care must be taken to not overwork the adrenal gland. Moderation in caffeine and alcohol can help with keeping the adrenal working properly. Positive Archetype of the root chakra is Mother. A great way to open and balance your chakras is to visit a Reiki practitioner. They work with energy and can help to open blocked energy centers. There are several yoga poses you can do to support the root chakra. A great one to start with is Mountain Pose. To practice Mountain Pose, stand with the bases of the two big toes touching, heels slightly apart, bringing your second toes parallel. Lift your toes, spread them and place back down. Slowly rock back and forth, side to side, slowly coming to a stop, letting your weight settle evenly balanced on your feet. Lift your ankles and the arches of your feet. Squeeze your lower legs towards each other. Tighten the muscles of your thighs and rotate your thighs slightly inward. Tuck the tailbone slightly but not so that the lower back rounds. Keep your hips even with the center of your body. Slightly draw in your belly. Inhale while lengthening your torso. Exhale and lower shoulder blades down and back. Broaden your chest across the collarbones while keeping shoulders in line with the sides of your torso. Keep arms straight, fingers extended, elongate your neck. Keep your breathing calm and even. As you exhale, allow your spine to lengthen more. Your gaze should be soft and forward. Hold the pose for one minute. ***PLEASE NOTE*** I suggest you get professional instruction for yoga poses to make sure you are doing them correctly. I also ask you seek medical advice first if you have any medical health issues. We are never too young to start a healthy diet. We definitely benefit from it as we age. Almost two years ago, I decided to no longer eat meat. Partly due to health concerns, partly due to spiritual acknowledgements, and partly because I don’t hunt or raise animals for food. I have no idea how the meat sold in stores was processed, how the animals were treated. I tried several times over the years to become vegetarian, but I never followed through because I was too used to cooking with meat. Trying to figure out what to eat that was vegetarian, that tasted good to me, that was within my cooking skill range, was a bit daunting. In the end, I would always go back to tuna casseroles and sloppy joes; smothered chicken breast; and breaded pork chops. Once I made the commitment to “go vegetarian”, I made it my mission to make sure I was not only getting all the nutrients and protein I needed, but to find easy but tasty wholesome meals to make. While going vegetarian isn’t for everyone, it never hurts to cut back on meat consumption and fill up on healthy vegetables, fruits, berries and nuts. Luckily, we now have many tools at hand where we don’t have to purchase a whole vegetarian cookbook that has only a handful of recipes we like to eat. There are tons of free on-line recipe sites with plenty of options and lots of information on switching to a vegetarian diet. One of my favorite places to go for recipes is Pinterest. I am going to share with you a recipe from GreenValleyKitchen.com that I found there that is easy and fast to make and was a hit with both me and my carnivore husband. *Asparagus is loaded with nutrients, helps to protect against and fight cancer, reduces inflammation in the body. It’s a brain booster and a natural diuretic. *Walnuts help reduce bad cholesterol, improve metabolism, control diabetes, boost mood and have anti-inflammatory properties. *Lemon aids in digestion, helps absorb Vitamin C, and boosts energy and mood. *Parsley improves digestion, has anti-inflammatory properties, helps control cancer, diabetes and arthritis, and is a diuretic. ½ pound of asparagus – snap off the tough ends – chop asparagus into thirds or smaller. 2 tbs grated parmesan, plus some to serve at the table. While waiting for the water to boil, chop your asparagus into thirds (snap off tough white ends and discard). Mince parsley, squeeze lemon, and measure out walnuts and butter. In a large saucepan, melt 2 tbs of butter over medium heat until frothy. Add chopped asparagus to the pan, stir slightly to coat asparagus with butter and cover with the pan with a lid. The asparagus should be slightly damp when adding it to the pan. The pan should only be on medium heat so you don’t burn the butter or the asparagus. Cook for 4 to 5 minutes – depending on thickness of asparagus. While asparagus is cooking, add ravioli to boiling water and cook as per the package instructions – my package said 4 minutes. Drain when done and add to a bowl. When asparagus is done, remove asparagus with a slotted spoon. There will be some browned butter left in the bottom of the pan. Add asparagus to the bowl of ravioli. Add lemon juice and 6 twists of black pepper to the pan with the remaining browned butter and bring to a boil and stir for 30 seconds. Pour the butter lemon sauce over cooked ravioli and asparagus. There will not be a lot of sauce – you just want enough to lightly coat the ravioli. Add walnuts, parsley and 2 tbs parmesan cheese – toss gently to mix. Served with a side salad, this really was a simple, wholesome meal. These past few days have found me perusing gardening books, seed catalogs, and articles with instructions to the perfect compost pile. It’s been a long time since I’ve had a vegetable garden, and I have never lived in Colorado until last fall, so the climate, the soil, are new to me. In Florida, my few attempts at container gardening were lost to bugs, heat, and vermin. My butterfly garden thrived, however, and kept the birds and bees happy as well. But vegetables, well, it’s been over 22 years since I had a vegetable garden. So now the fun begins. My old butterfly garden sits in Florida surrounded by what remains of my old life there. The memories are beautiful, but now it is time to make new memories and sow new seeds. If the milkweed I planted in Florida fed the being of the Monarch butterfly, so did the people in my life feed my soul. Here in a new landscape, I will cultivate seeds in my gardens. The butterfly garden will be filled with such treats as milkweed, wisteria, purple haze, thyme, and petunias. Pollinators will thrive from the newly planted food source, clear of pesticides, and birds will gather to rest and feed. The vegetable garden will produce healthy, nutritious food for our household, and contribute to the birds, bees, and butterflies. The brilliant hues of flowers, leaves, herbs, will serenade our homestead- Nirvana Acres- in a symphony of color as the wildlife contributes to the artistry of our surroundings. Pulling up roots, moving halfway across the country, and settling down anew parallels my current garden undertaking. After all, isn’t life basically about planting seeds, giving them nourishment, tending them carefully, and harvesting the fruit of our labors? Life, too, is like a garden. We decide what we will fill it with and who to fill it with. We cultivate our relationships, careers, and pastimes. Our bookshelves are filled with books that inspire us, intrigue us, entertain us. We might have collections to please the eye, or to declare what we love, what reminds us of a value. Pictures to harness memories. Favorite blankets to curl up under. We fill our lives with people who enrich us, enthrall us, are endearing to us. Souls that bring smiles to our faces, love in our hearts, laughter to even our darkest nights. It’s good sometimes, I think, to reflect on what we have planted in our life garden. Do we need to weed, to prune, to dig anything up? Should we water more or less, fertilize, rearrange? Is everything producing for us, or do some things need to go? And what would we like to have that we have yet to plant? Slowly, I am meeting people and making new friends. I tenderly plant them in my Beautiful People garden. Different shapes and sizes, they each contribute to this wonderful thing I call My Life. And eventually, I will share with them the food from my garden and the beauty of the flowers that will surround us. As winter rolls on towards spring, my advice is to take time to find out the state of your garden and what you have planted there. Remember, you harvest tomorrow what you plant today.